Farleigh Wallop is a small village and civil parish in Hampshire. An earlier Farleigh House was burnt down in the 1660s and not rebuilt till 1731 by Viscount Lymington. Some of the earlier structure was incorporated into the new house although various remnants survive in the garden to the east. The house is composed of two storeys, an attic and a basement. The east (1731) front is symmetrical with a canted bay in the centre. The window arrangement is 2.3.2. The hipped roof is slate-covered with two flat-roofed dormers on each side and two on the diagonal faces of the pyramidal roof of the centre. The bay is faced with fine ashlar and the central French window and two ground floor windows are round-headed and have rusticated surrounds. A carved coat of arms is placed above the French window. The main wall on either side is of squared flint. The architraves throughout are of stone (the upper plain but moulded in the centrepiece, the lower with cornice, keystone, and panel). It has a moulded cornice. The west front was reconstituted by H S Goodhart-Rendel in 1935. It has a tall projecting centrepiece, with the upper section in stonework supporting a coat of arms; below is a flush pediment, a roundel, a band, and a tall round-headed staircase window, the entrance now a square porch. On either side are short wings, and further projecting wings, and detached outer piers, to produce a symmetrical window pattern of 1.3.2.1.2.3.1. This newer work continues the old elevation style, enriched by the closer proportion of the elements, the total frontage being wider than the garden (east) front. There is a central entrance hall leading to an imposing octagonal room, which occupies the canted bay mentioned earlier. This has a magnificent view over the rectangular garden which with the sloping field to the east covers the site of the old house. There is also a small room with seventeenth century panelling and a stone fireplace, being a part, with very thick walls, of the earlier Jacobean fabric. Although much altered, staircases, door-frames and panelled doors, also survive from the 1731 building. To the south of the house is an eighteenth-century well-house with a large wheel, and to the north a low range of offices into which two large early seventeenth-century mullioned and transomed windows are built; they are of very good workmanship and doubtless formed part of the old house. 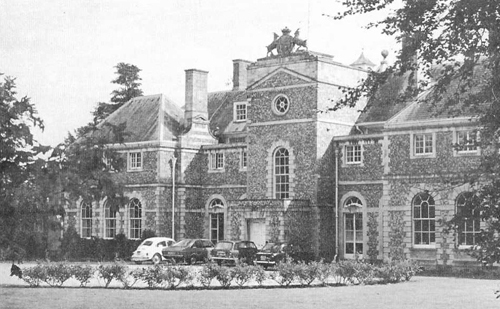 Farther to the north are the stables, a long two-story range standing north and south, substantial flint-faced buildings of eighteenth-century date, having the Wallop arms on a cartouche over one door, and the same quartering three bends wavy and a chief over another. The walled kitchen garden lies to the north-east, and in its centre at the intersection of four paths is the base of a cross which is perhaps of thirteenth century date, with part of an oblong shaft set in it. Crest: A mermaid holding in the dexter hand a mirror in the other a comb all proper. Arms: Argent, a bend wavy sable. 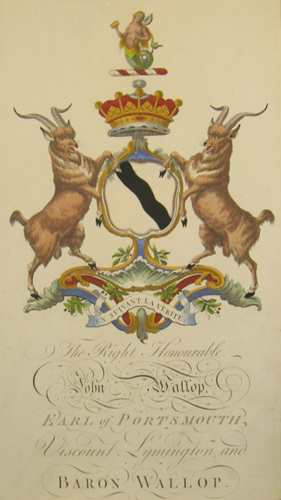 Supporters: Two chamois or wild goats sable. Motto: En Suivant la Verite. I was asked to advise on the use of colour. This has largely been taken from British Listed Buildings and British History Online. See also Country Life September 1941.